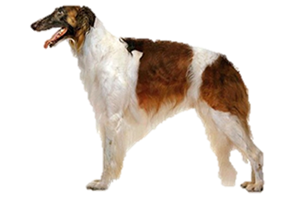 The Borzoi is a sighthound that was originally developed to hunt wolves in packs. Beaters would flush the wolves before the pack was released and when it was caught the dogs would hold their prey for the hunter to either make the kill with a dagger or muzzle the animal to take it alive. Their name is derived from the Russian word borzyi, meaning 'swift'. The exact origins of the Borzoi are unknown, although it is believed that Greyhound-like sighthounds were brought to Russia sometime between the 9th and 10th centuries. These dogs could not withstand the harsh climate and so were therefore crossed with several local dogs to improve their tolerance. These dogs were kept by Czars, nobility and aristocrats, their wolf hunts a favorite pastime. Both the dogs and horses were colored in ceremonial silks and there was feasting at the completion of the hunt. Because of their close ties with nobility the Borzoi was completely exterminated in their homeland during the Russian Revolution in 1917. Luckily, it had already been established in other parts of the world and would later be imported back into its homeland. Is the Borzoi Right for You?